By Benjamin Weiser. New York: Public Affairs, 2004. 383 pages. Espionage is the staple of intelligence fiction. In reality, espionage provides a very small part of intelligence collection, much more of it coming from technical sources. But the right spy in the right place with good access can be crucial. And, as most intelligence practitioners will acknowledge, the most useful spies tend to be "walk ins," spies who volunteer rather than being recruited. Aldrich Ames, Robert Hanssen, and several others "walked in" to the Soviet Union; Oleg Penkovsky and Ryszard Kuklinski "walked in" to the United States. Kuklinski, a Polish General Staff officer, became convinced that he was on the wrong side in the Cold War and that Poland was a poorly treated Soviet vassal, not a truly independent state. 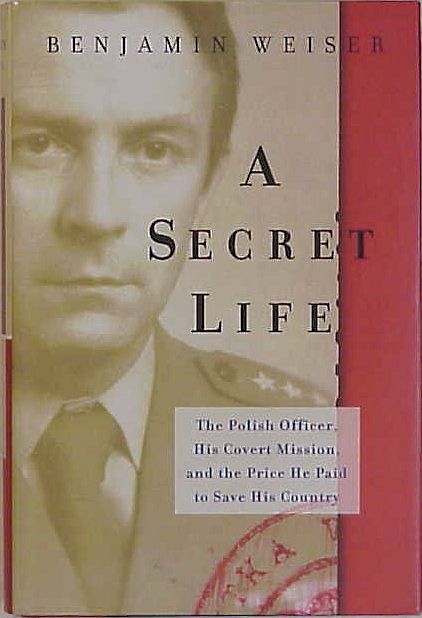 He believed that spying for the U.S. was an act of Polish patriotism. Bernard Weiser's A Secret Life is a well-written account of Kuklinski's life. Weiser is especially good on what motivated Kuklinski to become a spy. The Soviet-led invasion of Czechoslovakia in 1968 and the subservience of all Warsaw Pact militaries to an evidently aggressive Soviet military were major factors. Kuklinski comes across as patriotic, moral, and driven. On several occasions his CIA handlers suggested that he suspend his activities, either to allay suspicion or to give Kuklinski a rest. Kuklinski would agree but would go on copying crucial documents nonetheless, providing a voluminous trove over seven years. Weiser's book is based on CIA files and interviews. He handled the issue of access to classified material rather deftly, getting the CIA to allow a retired officer to read the files and pull material, which the CIA then reviewed and passed to Weiser. Thus, Weiser could write from documents without worrying that he was including something that he could not use or might have inadvertently committed to memory. Some of the quotes from documents seem a bit long but the sources are solid and there is abundant espionage "tradecraft." A key component of Kuklinski's story..